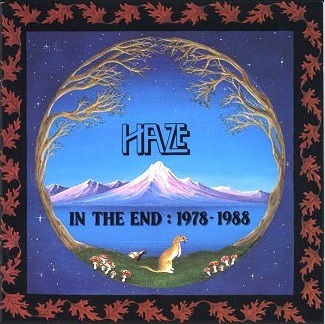 In the End: 1978-1988 is a compilation of various tracks that chronicle the 10 year existence of one the more undeservedly obscure UK progressive bands. In their early days, the band suffered from personnel turnover, but interestingly enough all the material on the CD was recorded from the same lineup: brothers Paul McMahon (guitar, bass), Chris McMahon (bass, guitar keyboards) and Paul Chisnell (drums). All the material has a rather sparse sound, mostly a result of four-track tape masters and an almost live-in-the-studio recording style. The earlier material has a soft spacey feel mixed with a healthy dose of 1974 era Barclay James Harvest. Later tracks begin to sounds a little like early Saga, particularly on the track "Mountain." Haze toured with Solstice and Pendradon, so that should give you some indication of the type of music they play. Most of the tracks include an extended instrumental section where the playing can get quite spirited. As the band developed, a number of conflicting influences can be heard. Paul McMahon seemed to be moving in a more funky direction where the rest of the band was improving on their original format. For the most part the result is not good. This eventually led to the end of the band shortly after the 10 year anniversary show, of which the track "The Red Room" hails. I really have tried to dislike this disc but it hasn't worked. I can't put my finger on it, but there is something about this disc that I do like. It might be the nonpretentious vocals, the simple song construction, or subliminal messages. Whatever it is, it works.